With increasing pressures to ensure responsible performance and positive impacts, more organizations are going beyond regulatory compliance and turning to certifications as a way to validate their policies and programs. How can organizations best satisfy stakeholder demands for transparency while ensuring the implementation of their corporate level approaches at the site level? While all third-party assurance options evaluate the implementation of existing structured approaches, there is an incredibly diverse range of options in terms of assessment type and issues addressed. 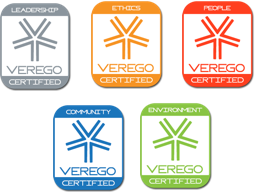 Over the last several years, Sutherland has been able to achieve Verego SRS Certification at the assessed sites to transparently validate their implementation of responsible business practices. These approaches have been identified to align with industry leading best practices and global standards for performance in the workplace and external to the organization’s operations. While Sutherland has demonstrated continuous execution of responsible performance, it has also improved upon its assessment results in multiple areas of the Verego SRS Standard. Sutherland places itself as an industry thought leader with validated approaches for continuous improvement across the spectrum of social and environmental issues.